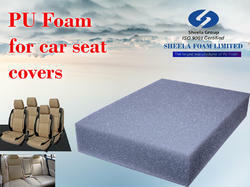 Pioneers in the industry, we offer seat covers foam, flexible pu foam, pu foam for sofa and pu peeled foam from India. We are the pleased to introduce ourselves as the largest manufacturer of Flexible Polyurethane Foam in India for more than 40 years. We are a USD 250 million group and rank among the top 5 PU Foam manufacturing companies in the entire Asia-Pacific region.Supplying/Servicing our products to satisfied customers in more than 32 countries world wide. We have won several prestigious Top ranking awards from Indian export promotion council in recognition of our excellent export performance. And it also wears the badge of a Government Accredited One Star Export House - a title conferred on companies that meet international standards of quality and excellence. We have production manufacturing capacity more than 60,000MT PU Foam per annum and having 1500 employees across the 15 Factories/Branches in India. We have world’s best high pressure renowned Hennecke Foaming Plant and State-of-the-art world best machines in all the plant in India. The PU Foam is available in various densities, colour, length and width. Memory (Visco Elastic) Foam etc. Filter foam for AC, Compressor Automotive etc.. These PU Foam Sheets are 100% pure foam. These are available in different density’s and can be cut in different sizes. Foam Sheets are basically used in furniture, car interiors, softlineing, packing, car filters etc. Sofa Polyurethane Foam is 50% more dense than the air-lite high density foam.can use it in your chair pads or massage tables. We are the leading Manufacture & exporters process Peeled Foam for car interiors and car seat cover in various densities, color, length and width as per customer requirement starting from a thickness of 1. 8 mm onwards. For flame lamination application our PU peeled foam meets the mvss -302 flammability standard, we are already selling our products in huge quantity to lamina-tors world wide.